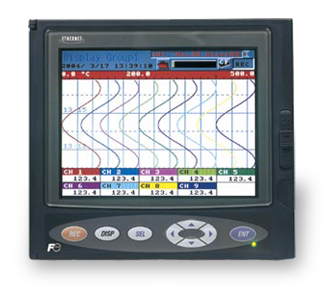 The compact PHL Paperless Recorder from Fuji Electric is an 9 or 18 channel recorder that displays data on a bright 5.7" TFT Color LCD. It offers a wide variety of display modes which allow users to view data in the form of Trends (Horizontal & Vertical), Bar Graphs, Analog Meters, Digital Display, Totalized Display, Event occurrence and more. Switching between modes is quick and easy with the 8-key front panel. An adjustable time screen function extends the life of the display and reduces power consumption. Users can record upto 12 types of thermocouples, 5 types of RTDs, and DC Voltage / Current input on one unit. The PHL Recorder can record years of data on a 1 GB Compact Flash Card. Saved data can be called back and played on the display screen. With Math function being a standard feature, the PHL can easily display results of desired formula using operands like addition, subtraction, multiplication, division, absolute value, x to the power of y, logarithm, natural logarithm, exponential function, humidity, average value, maximum & minimum values and more. Calculation functions like F Value calculation, Totalization & Square root extraction are also available as a standard feature. Moreover the user can also program upto 4 soft alarms per channel (provided as standard) and link them to an optional 10 point relay output card. The PHL is equipped with an optional RS-485 MODBUS RTU protocol & Ethernet (10Base-T) ports. Thus allowing for FTP transfer of files stored on the recorder's Compact Flash Card and for live monitoring of all input and alarm status vie HTTP. The PHL also comes equipped with a PC based DataViewer software & Parameter Loader software along with USB configuration cable, waterproof gasket for the front fascia, noise filter for the power supply, instruction manual & panel mounting brackets.